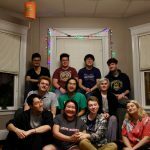 While many students flocked to Tisch Library last reading period, about 20 members of the Tufts Labor Coalition (TLC) left their books behind to hold a 33-hour sit-in in Ballou Hall, demanding a stop to impending job cuts for janitors. 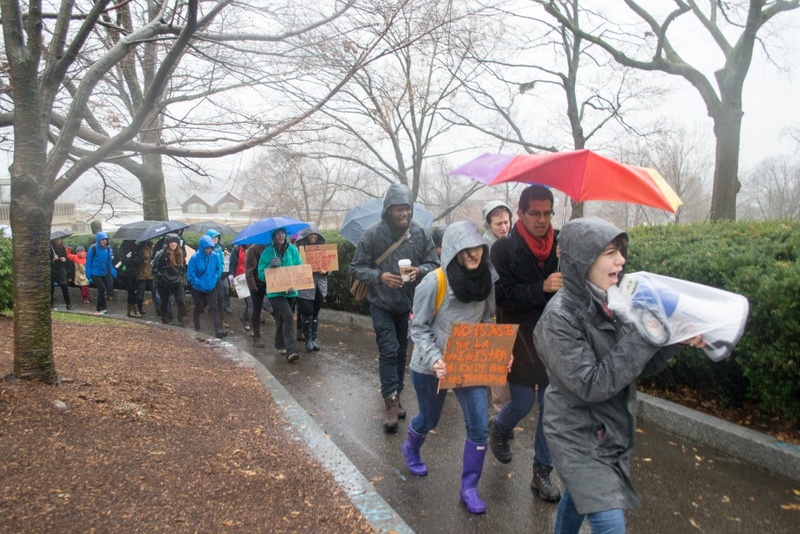 A group of other students, both TLC members and nonmembers, along with janitors from Tufts’ Boston and Medford campuses, faced frigid temperatures, wind and rain to rally outside Ballou in solidarity. These actions came soon after a new five-year contract between Tufts and DTZ, the vendor that provides Tufts’ janitorial services, was signed this summer. On Nov. 21, Executive Vice President Patricia Campbell and Vice President for Operations Linda Snyder sent out an email to the Tufts community explaining some of the goals of the new contract. “[This] agreement reflects our commitment to control costs, maximize resources to support our core academic mission and support our sustainability goals. The new contract also seeks to increase the number of full time, benefits-eligible custodians working at Tufts,” they wrote. TLC President, sophomore Lior Appel-Kraut, explained that she and the rest of TLC became involved in this particular issue following discussions with the workers themselves. “Right after [the signing of the new five-year contract], janitors started hearing rumors from managers, from each other, that there were going to be upcoming cuts,” Appel-Kraut said. When TLC members heard about their suspicions, they began looking for more information. “We have relationships with a lot of the workers just as individuals, and so [when] they started expressing that to us, we started pressuring the administration to tell us more,” Appel-Kraut said. Appel-Kraut explained that cuts were a concern not only because of the layoffs, but also because the remaining janitors would need to work even harder to pick up the work that laid-off janitors had been doing. “The janitors were expressing [that] they’re already working large amounts of spaces. 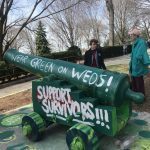 Cuts would mean that each individual would be [cleaning] more space and that people would lose their jobs, and that isn’t a responsible or just way for the university to cut costs,” she said. Appel-Kraut and senior Spencer Beswick, former TLC president, served as TLC’s spokespersons in the negotiations. According to Appel-Kraut, after an initial conversation with Campbell, TLC members regrouped to discuss how they should move forward, agreeing that they would not leave Ballou until certain demands were met. This ultimately resulted in the students sleeping over in the administrative building. “Once people left, there were police both at the door and in the only room we were allowed to sleep in. We weren’t letting people back in, [and] we could only use one bathroom.” Appel-Kraut said. Appel-Kraut believes that the sleep-in was a turning point in negotiations. “I think [the sleep-in] was really important to show the administration how serious we are,” she said. Appel-Kraut, Beswick and Campbell ultimately signed an agreement on Dec. 10, effectively ending TLC’s sit-in. The agreement includes nine terms, among them the promise of no layoffs until April at the earliest and a commitment to transparency between TLC and the administration. 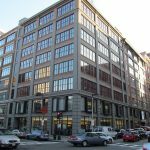 TLC will also host an open forum in early February that the administration has agreed to attend, which will allow the community to respond to the proposed plan between Tufts and DTZ. The details and date of the forum are still being planned. According to Appel-Kraut, TLC and the administration will plan the forum together. In addition to the public forum, there will be three opportunities for janitor input that will work around janitors’ shifts, Appel-Kraut said. Campbell expressed a readiness on the part of the administration to address student concerns. 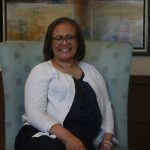 “We’re always, always happy to engage in conversation and discussion with our students, and I think that as the event progressed I had some extensive and I think very beneficial conversations with student leaders that represented the group of students that were demonstrating,” she said. Campbell said she proposed that TLC and the administration meet every other week in order to maintain the dedication to communication and transparency between the two parties that was part of the final agreement. “Students will hear information and it’s not necessarily accurate, or the people they’re getting their information from may not be fully informed, so I just thought it would really be a good idea … to get [in] a regular habit of communicating so that people are well-informed and accurately informed rather than not,” she said. Snyder voiced a similar appreciation for student involvement in campus issues. “I love working with students, and I really respect and support students’ ability and desire to create positive change,” she said. Beswick said that students’ concern for workers’ rights has helped TLC grow significantly over the past semester. He described what he believes to be the role of the Tufts administration in situations like this one. “The role of the administration is to serve the Tufts community. When students, workers and professors come together to demand justice for community members, as we did for the janitorial staff and have done for adjunct faculty, it is the responsibility of the administration to listen to our demands and respond to the needs of the community,” Beswick told the Daily in an email. Appel-Kraut further explained that although these situations can be challenging for members of the administration, they still must be held accountable for the decisions they make. According to Appel-Kraut, TLC plans to collect a student list of ideas for other areas to make cuts, in order to give the administration a sense of students’ priorities. Snyder explained that the administration has a variety of priorities to consider when it comes to university operations. 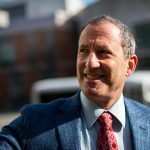 “We’re very committed to change and reorganization where reorganization is needed, but doing it in a way that meets all the goals— the goals of the university that are financial and very important, our sustainability goals, goals of how we hope the workforce wants to be treated and can be treated,” Snyder said. Although TLC did not achieve its initial goal of an agreement from the administration promising no janitorial cuts for five years, its members are not giving up. First-year Nicole Joseph, a TLC member who helped organize the rally outside Ballou during the sit-in, explained that TLC still has more work to do. “Now that we have a few concessions, we have to capitalize on them and make sure that the few things [the administration has] given us can get us what the janitors ultimately want at the end of the day, which is job security,” she said. Beswick agreed that while the negotiations were an important step toward achieving TLC’s goals, the group is not done yet.